Control methods for aquatic weeds are numerous and varied but may be divided into physical, chemical, and biological approaches. Currently, only mechanical methods are used to control Eurasian watermilfoil in the Okanagan. Rototilling – Rototilling removes the roots of the plant from the lake-bottom sediments. It is not selective, but areas with native aquatic plants can be avoided. Although 100% removal is not achieved in one treatment, repeat annual applications reduce the weed density to a very low level. The actual effectiveness depends on many factors but chiefly on the type of substrate and rate of re-infestation – usually from adjacent weedy areas that have not been treated. For the most part, there are few aquatic weed problems in the gravel substrates frequented by spawning fish, and operators avoid tilling these sections or creating silt in adjacent areas.Eurasian watermilfoil is a rooted perennial plant that over winters in lake bottom sediments after the top growth of the plant has died back. Rototilling takes place from November-April and takes advantage of the fact that milfoil roots float when dislodged and freed of sediment and the cold temperatures reduce the survival of rototilled root fragments, which keeps reinfestation to a minimum. However, weather conditions can be extreme on the lakes in the wintertime, and tilling has to be suspended when the lakes begin to freeze over.The technique is pretty simple. An area is marked out with floats and crosshatched by the machine. The tiller is lowered to the bottom (4.5 metres or less) and the operator feathers it along the bottom. We have not found a good way to adjust the depth of penetration of the tiller automatically, and rely on the skill of experienced operators. 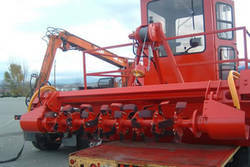 The cost of rototilling is approximately $2,500 per hectare.The OBWB rototilling equipment was all designed and built locally. To our knowledge, there are no manufacturers or contractors supplying this type of equipment. Over the years, the watermilfoil control crew have greatly refined the design of these machines, for improved performance, comfort and ease of use. 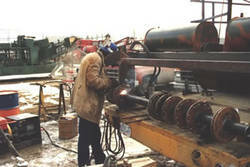 Operators are also responsible for transportation and repair of all equipment, and the Water Board maintains a full machine shop. 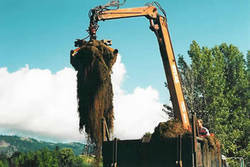 Harvesting: Harvesting is essentially “cosmetic control.” The plants are mowed about 2 metres below the water surface creating a more usable recreational area and an improved appearance.The cost of harvesting is lower than rototilling – about $800-$1000 per hectare – but has a number of disadvantages. Although harvesters can cover a given area more quickly, cutting must wait until plants are near surface in the late spring and summer. 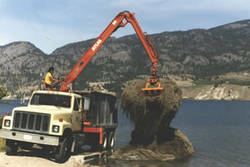 The harvesting operation interferes with water recreation, has a short operating season, and involves dumping tons of cut weeds on the beaches and then trucking them away. More than one cut per season can be required as well.Because of these disadvantages, over the years the emphasis has changed dramatically from almost total reliance on harvesting to using rototilling as the primary method for watermilfoil control. In 1981, 1800 machine hours were logged by four harvesters, with only 100 hours of rototilling. By 2001 the program consisted of 1600 hours of rototilling and only 250 hours of harvesting. The harvesting program was reduced from four machines to two and two additional rototillers have been added.The one bright side to harvesting Eurasian watermilfoil, is that it makes a useful mulch and addition to compost. 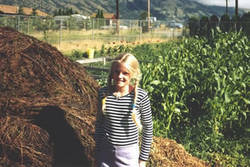 Almost all harvested weeds are used by residents or commercial vegetable growers in the valley. Apart from natural grazing by native animals and insects, biological controls have not been used in the Okanagan — although the Water Board has worked to keep current with advances in this area. The Federal Government does not permit the open introduction of non-native biological control organisms for fear the control agent itself may become a pest. There are a couple of approaches that are of interest but have not so far been used in the Okanagan. The watermilfoil weevil (Eurychiopsis lecontei – for those with a fondness for Latin) is native to North America and to the Okanagan and is an herbivore of watermilfoil. Adult weevils live submersed under water and lay eggs on the growing tips of the plant. The larvae bore down through the stem, allowing diseases to enter that suppress growth, reduce root carbohydrate stores and cause the plant to sink. The effectiveness of the weevil is hit and miss in regions where it is used. In nature, insects rarely reach densities high enough to cause widespread damage – i.e., control – over a nuisance plant. The insect must be artificially reared and introduced to the lake in sufficient quantities to do the job. Another insect native to the Okanagan which damages Eurasian watermilfoil is a chironomid (midge) larva (Cricotopus myriophylii). Attempts to rear the insect in the laboratory and introduce it to the lake failed, and while natural population levels damage milfoil plants in small areas, no acceptable level of control occurs. The Chinese grass carp (Ctenopharygodon idella) will consume tremendous quantities of aquatic plants but also eats many native plants, and in fact, often prefers other plants to watermilfoil. The grass carp are primarily used in small lakes or ponds where stocking rates are affordable and the fish are confined to the problem areas. To prevent reproduction of the carp only triploid sterile fish are used. The plant pathogenic fungus (Mycoleptodiscus terrestris) attacks Eurasian watermilfoil and has been shown to significantly reduce plant biomass in laboratory studies. The same damage has not been achieved in field trials. Biological control methods do not eliminate the target weeds, and a continuing maintenance program is needed. No herbicides are used in the Okanagan Basin Water Board’s watermilfoil control program. In the late 1970s test plots of Eurasian watermilfoil were treated with 2,4-D in granular form. Although 2,4-D is a systemic herbicide, taken up by the plant and capable of killing the root, repeat applications are needed, usually on an annual basis. This chemical is the same active ingredient that is found in many lawn weed killers. Another herbicide, Diquat, was tested once in the mid 1970s. It is the chemical equivalent of mowing the top growth of the plant and does not affect root viability. All the Okanagan lakes are used as drinking water reservoirs. Aside from citizen concern about chemicals in our water supplies, neither of these herbicides provides long term control. Many other herbicides have been developed for aquatic weed control, but very few are licensed for use in Canada.